The new Frame Rate Target Control feature enabled in AMD's new Radeon graphics card has a big effect on your gaming PC's noise and power consumption. For years, AMD has prioritized raw graphics processing horsepower over things like power efficiency and quieter operation. Then Nvidia’s Maxwell architecture came along and proved that video cards could dominate the benchmarks while still sipping power. With the launch of the new Radeon Fury X and Radeon R300 series, AMD has responded to community criticism and competitive heat with Frame Rate Targeting Control, a meaningful feature that has a serious impact on daily gaming sessions. 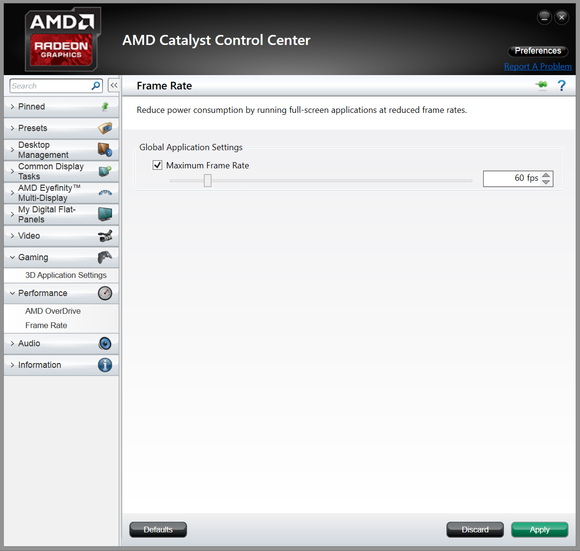 Frame Rate Target Control (FRTC) is a new option in AMD’s Catalyst Control Center that lets you set a maximum frame rate between 55 frames per second and 95 frames per second (fps) for the majority of DirectX 10 and DirectX 11 games. The message from AMD is that FRTC is a triple threat of benefits: You’ll dramatically reduce your video card’s power consumption, decrease fan noise, and lower the operating temps of your GPU. Obviously we had to put those claims to the test. 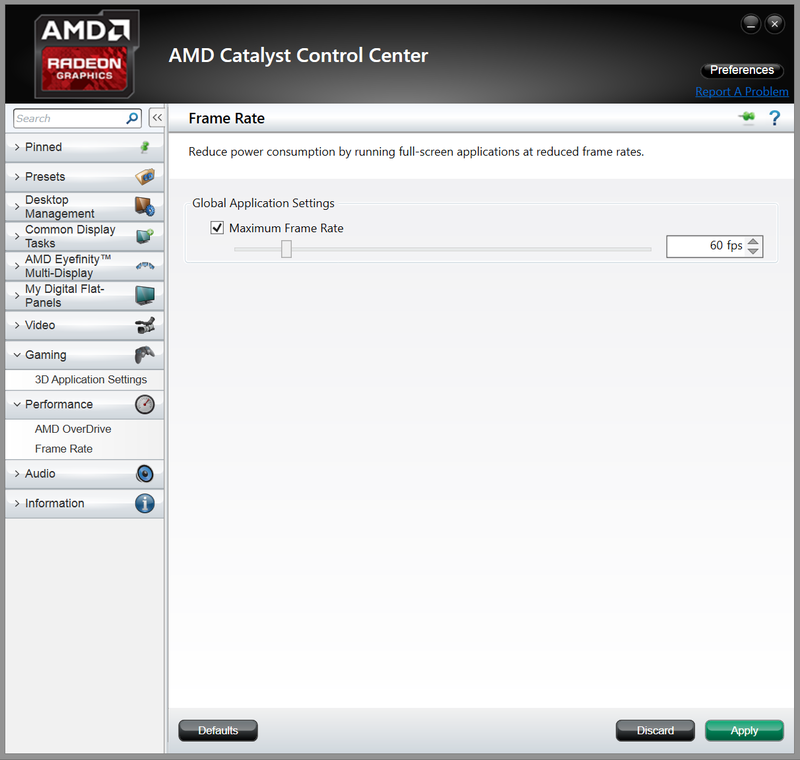 The Frame Rate Target Control options in AMD’s Catalyst Control Center. Wait, back up. Why on Gaben’s green earth would we PC gamers—who are addicted to stunning eye candy and smooth-as-silk frame rates—want to limit our fps? Well, there are a ton of games out there that hit super-high frame rates on modern video cards. Your PC is effectively throwing them away and needlessly taxing your video card on three fronts: Power, noise, and temperature. 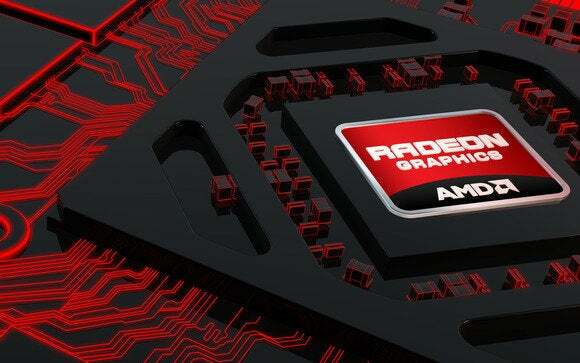 This wasteful behavior prompted AMD to design FRTC. Saving a few bucks on your power bill is likely lower on the priority list, but the dog days of summer and scorching GPU temperatures don’t mix. Less heat on your card means less stress, and less stress means a longer, healthier lifespan for your hardware. Plus, a reduction in noise output from our video cards mean more immersion in our games. The need for FRTC made itself abundantly clear when I booted up Civilization: Beyond Earth and noticed that literally thousands of frames were being wasted in the menus. Per second. Being a fairly lightweight game, my fps spiked north of 2000 inside the menus. I was reasonably startled when I discovered how much needless electricity that was consuming, and the difference it made to GPU temperature and overall noise. 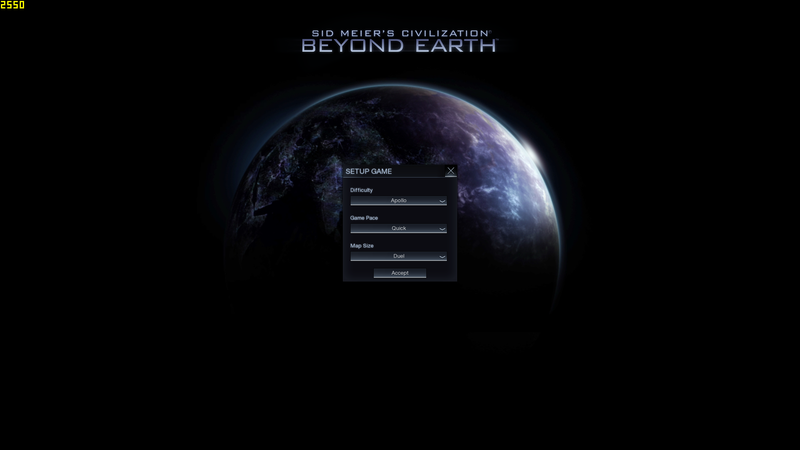 A Civilization: Beyond Earth menu screen. If you click to enlarge the image, you’ll seen the frame rate in the upper-left corner—an insane 2550fps. Even during normal gameplay, though, the advent of AMD’s FreeSync has reduced the need for insanely high frame rates. The bottom line: Constraining your frame rate often has a negligible impact on the overall gameplay experience, and as you’ll see in a minute, the benefits to doing so might be worth pursuing. We rounded up AMD’s new flagship Radeon Fury X and a Sapphire Tri-X Radeon 390x to observe FRTC’s impact on both liquid-cooled and traditional air-cooled video cards. 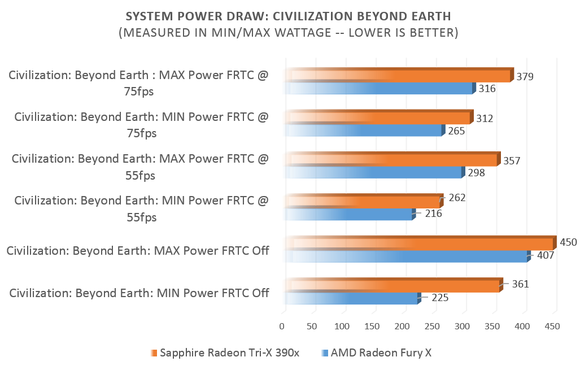 We then fired up Dirt Rally, BioShock Infinite, and Civilization: Beyond Earth at 1440p and measured minimum and maximum system power draw levels with FRTC off, capped at 55 fps, and capped at 75 fps. To get a good bead on any noise level and GPU temperature improvements, we ran the Heaven Valley benchmark in 15-minute loops and took note of peak decibel levels and temps under load once the cards were nice and warmed up. With FRTC off and Heaven Valley set to Medium quality at 1440p, frame rates ranged from 75 fps all the way up to 120 fps, depending on scene complexity. What happens when we put a leash on those frames? 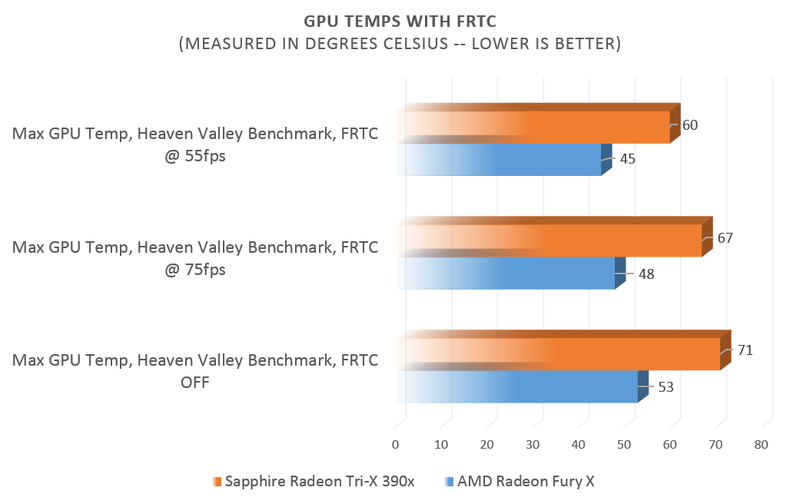 The already-cool Fury X sees a 15-percent temperature reduction, and Sapphire’s air-cooled 390x reaps the identical benefit, dropping from 71 degrees Celsius down to 60 degrees Celsius. 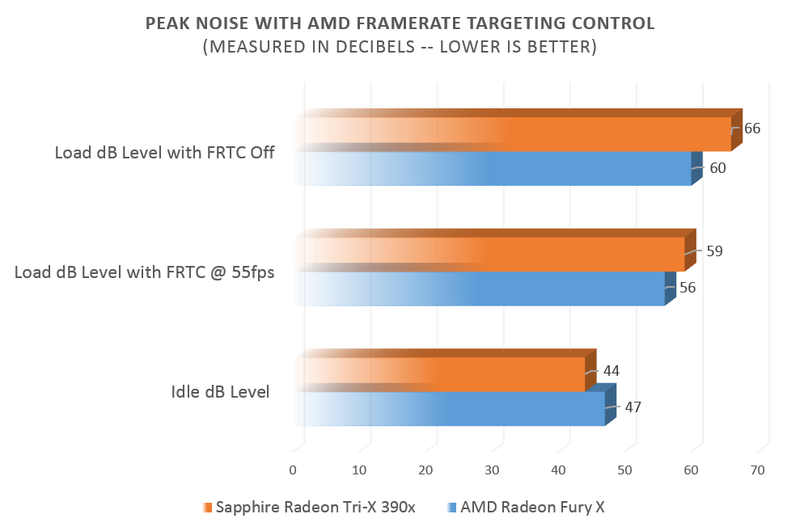 No one enjoys a noisy graphics card whirring away in their chassis, which is why it’s awesome to see that FRTC has notable influence over noise levels. Sapphire’s 390x starts off reasonably quiet, but with FRTC capped at 55 fps (currently the lowest setting possible), it dives from 66dB to 59dB. On the surface that might seem inconsequential, but decibels are measured in increasing magnitudes of intensity. This translates to a card that isn’t merely 7dB quieter—it’s 1.6x quieter. 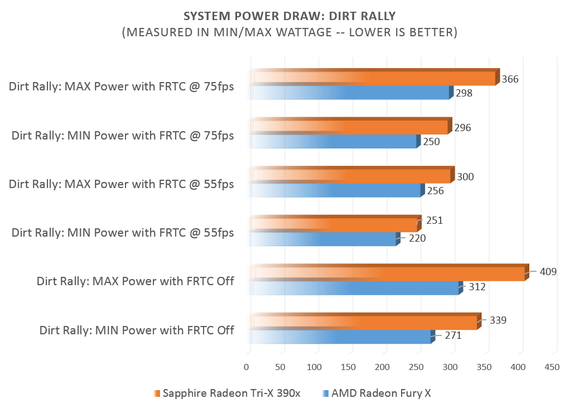 So how about AMD’s power consumption claim? Does trimming the frame-rate fat really result in less system power pulled from the wall? It does indeed. 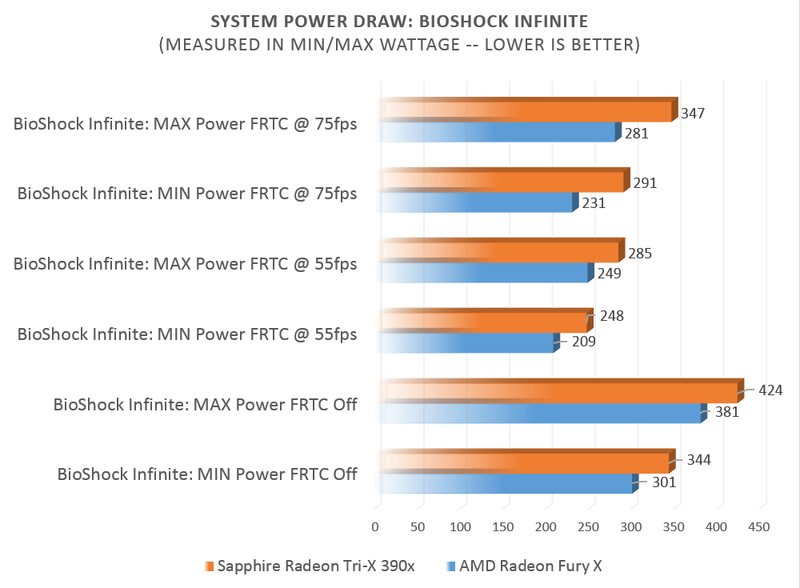 Take a look at that BioShock Infinite chart, especially the Fury X results. It’s a power hog with its frame rate left unencumbered (in the low to mid 100s). The minimum amount of power drawn from the wall while running with FRTC off is higher than the maximum power draw with FRTC set to 55 fps. All told, it’s a healthy 34-percent reduction in wattage at the wall. Other high-frame-rate titles like Civilization: Beyond Earth and Dirt Rally exhibit similar—if a bit more minor—energy savings. So with a simple Catalyst Control Center tweak that taps into Radeon 300 series graphics cards and AMD’s Fury lineup, we see a meaningful set of benefits. AMD’s Frame Rate Target Control makes your PC gaming sessions more enjoyable by turning down the ambient volume, dropping the degrees, saving you a few bucks at the wall, and likely extending the life of your video card by removing some unnecessary stress. Update: The release of AMD's Catalyst 15.7 WHQL drivers extended both FRTC and AMD's virtual super resolution to the vast majority of Radeon R200-series graphics cards, as well. There’s one minor quibble worth pointing out. Originally we wanted to test Blizzard’s Heroes of the Storm, but found that FRTC had no effect on it. We then bounced over to Diablo III, and FRTC was once again ineffective. At this point we suspect it’s a glitch with Battle.net titles, at the very least within our test environment. An inquiry to AMD has gone unanswered as of this writing. That said, we’ve been impressed with Frame Rate Target Control while thoroughly testing it over the past few days. The experience is augmented even further when you incorporate one of AMD’s FreeSync panels, which allows your display to dynamically sync its refresh rate with your GPU, eliminating screen tearing and input lag from the equation. But with or without FreeSync, FRTC is a very welcome new feature in AMD’s software ecosystem. Editor's note: This article was originally published on July 2, but was updated on July 11 to mention that FRTC now supports Radeon R00-series graphics cards as well. When he's not hiking through Nevada's mountain ranges, Jason Evangelho is preaching the gospel of DIY PC builds and breaking Rock Band drum kits.